This set contains a 10 inch open fry pan and a 10 inch 3.2 Qt casserole. The 10 inch fry pan is a very flexible pan, with many uses. The 3.2 quart casserole is perfect for sauces, sauteing and warming. The high sides allow for easy flipping and shaking of foods. It has a vented metal rimmed heat tempered glass cover. 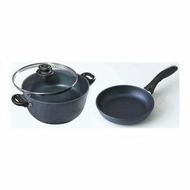 The non stick cooking surface makes for unequal food release and easy cleanup. It also provides perfect heat distribution with no hot spots.